This wine is a perennial favorite of Windham Wines’ customers. We were without it for nearly a year. Then in early summer, the distributor was able to get more. Windham Wines took all but a case. An unusual combination of Viognier and Sauvignon Blanc, the two grapes are happily blended via the skill of the eminent owner-winemaker at Saint Cosme, Louis Barruol, about whom we’ve written before. 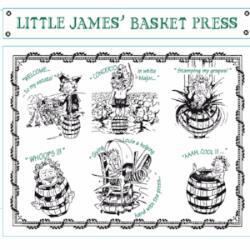 I will include his note for the 2016 Little James, Blanc. Blending Viognier and Sauvignon is very rare, probably because the varietals are traditionally grown in different regions, except in Languedoc where they grow side by side. I like to marry the two because they have proven themselves to be complementary. Blending grape varieties and crafting them together is more than just a question of analysis, figures and theories – it is mainly about style and alchemy. Just like music is not merely a combination of notes – they have to mean something musically and be coherent – wine is the same. It is amazing to see that, irrespective of the vintage, one of the two grape varieties always provides a solution when the other is slightly under par. Treat yourself to some Little James – that is its sole purpose, to be the ultimate wine for indulgence.